With all the activities and work that mom is involved in with family, church and community, one would not suspect that she is a person currently with an ill health condition. She is a living example of a woman who is unstoppable to live life to the fullest, doing the best she can even when facing adverse situations. Here is the latest of her experience. On Friday 20th May, for the past 2 days she had a high fever that would not subside. Upon a check up with a local clinic, the doctor diagnosed her as anaemic and advised her to go to the hospital immediately. At the hospital, blood tests later showed she had a low blood cell count and was immediately given a blood transfusion. Plans fixed months ahead with air tickets booked and prepaid was that she was to fly off to the US on June 6th with the first group of 4 family members for Su's wedding so with this occurrence, is it still possible? The second group of 3 was to be led by Dad on June 11th after the two boys finished their school activities. Her determination to be there for her daughter's wedding provided a challenge to the head oncologist, Dr Koo Wen Hsin to find a way that would be safe for her to make the journey! After some thinking, he came up with the solution. He recommended that she cut the duration of her stay in US from 3 to 2 weeks which meant she would fly later with the 2nd group with Dad while Han the oldest will take over the lead to still leave on 6th June with Ray the youngest and their cousin Ying Er. Talking on a Skype call to Su from the hospital bed, shedding tears on both sides as Mom relates recent challenges encountered. On Sun 22nd May, they conducted a CT scan on her to give Dr Koo a better picture of Mom's condition. The experienced and wise Dr Koo made another recommendation. Knowing that once in a foreign country, if Mom would fall ill, finding medical attention with doctors that didn't know her history could be fatalistic. He suggested implanting a Hickman line on her body exiting on her upper chest that would allow intravenous administration of any required drug or blood transfusion with quick access to her blood stream instead of looking for her veins with a needle that is harder and more time consuming. On Tue 24th May, the Hickman line was implanted and in replacement of the oral chemo taken earlier, a liquid supply is now fed to the line stored in a small bulb like container attached to her waist! This means Mom could travel without interruption of her chemo drug supply that was being released to her body slowly through the Hickman line. How marvelous and advanced medical science has progressed to help Mom fulfil her wish. She could be discharged from hospital to return home until the next check up to see Dr Koo on the following Tuesday. For the next few days, Mom's condition was closely observed especially her body temperature. Good news is that after the initial fever in the first night home, her body temperature was soon normal and stabilized. Dixon and his wife Chelsea became our close neighbors in Singapore when they first came for Dixon to attend Duke NUS graduate medical school in the year 2007. (See the Joyous Christmas Day we spent together in 2009) Some interesting developments came from this connection beyond our expectation. Chelsea's parents David and Cathy Bush, who are from Logan in northern Utah, came to Singapore for a visit. They generously offered their home if we were to visit Logan which wasn't a possibility then as in all our trips to Utah, we would be staying south of Salt Lake city in areas closer to Provo where the Brigham Young University is as Su studies there. When Fei announced her marriage to Christopher Wyatt in Logan Utah for 29th May 2010, we accepted the Bushes hospitality where their home became the bride's home for the wedding! See the journal post here. Today Dixon Grant is the New Doctor in Town! New or Old doctor, we are grateful and appreciative of both doctors and the science they learn and apply to make the lives of Mom and many other patients a happier one! We also like to thank the many friends and family members who have shown their love, concern and support in various ways to Mom in her hour of need. Tue 31st May : Did a follow-up visit with Dr Koo today and the blood test results didn't look good as the blood cell count was low. The dilemma is to decide whether she needed a further blood transfusion or a booster for the Chemo as the count can be low either due to the Chemotherapy that kills blood cells or the cancer in the bone that is causing it! Dr Koo wants to make sure she is safe to travel and we've already changed her departure date to leave later with me on June 11th instead of her leaving as planned in the first group on June 3rd. We gave Dr Koo more time to assess her condition with time for observation of each action taken. Mom was in opinion that she was feeling better without bone aches or pains that she felt earlier. This could mean her current chemotherapy was working. Another more detailed blood test was to be made with another appointment fixed on the following Tuesday Jun 7th to be sure. She was to also top up her 'bulb like' container that stored the liquid Chemo drug which was almost empty after a week of usage. June 7th has to be the decision date if Dr Koo can let her fly or not!!! Let us all pray hard for her to be fit enough as well as being safe to do so. Click here to find the photo taken inside and the results! Wed 8th June : Mom came back to the hospital for the recommended booster shot of 2 pints of extra blood. She was chatting with Fei online. She had finished the first packet containing a pint of blood and the nurses hooked up the second packet for her. 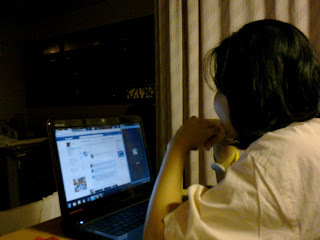 She was alert and comfortably text chatting with Fei online on Skype. Less than half hour later she started getting a reaction telling me she was feeling cold and having back pains. It was such a sudden change of physical condition for her, turning into almost a 'fit'! She couldn't type any more and I had to leave a message for Fei that she needed to rest. The time was about 4.30pm.The nurses were called for and they quickly reacted by stopping the flow of further blood from the 2nd packet. It obviously had to be from a different donor with a different quality of blood as one person can only donate 1 pint of blood at a time. The nurses explained that this some times happens as the receiver's body may reject the new foreign blood for some reason. They had to extract some blood from Mom from her feet to do some tests to compare to the new blood to know the reason why. This only caused her to scream with pain when they tried to extract some sample blood due to her very small and tight veins. They couldn't take it from the Hickman's line as that was already contaminated with the new blood. They also gave her an injection to make her feel more comfortable or warmer plus panadol orally. After some rest she felt better and a wheel chair was provided to prepare to bring her home. It was already about 6pm. We were told that Mom was to be brought back to hospital again the next day to learn the cleaning process of the Hickman's line. Perhaps we may get to know why the 2nd packet of blood did not go well with her after the tests that they would do. What a fright it was for Mom! In the evening, our home teacher from the Church, Alaster Tan, was called in to assist in giving a blessing with Dad. Thu 9th June : The Relief Society Sisters were here again to help the family. When Mom first had to be admitted to hospital, food was cooked and brought for the family. A family member had also offered rides to mom to the hospital. The Bishop and wife had also visited the home after mom was discharged. Today two RS sisters would help accompany Mom to do some shopping for the trip and later bring her to the hospital for her 3.30pm appointment. I was to spend time at home getting organized with the luggage to bring all the big bags back on the van to KL while Mom and the two boys would ride comfortably on the coach to KL on Saturday. What would you expect when 3 women go shopping together? At about 3.30pm the hospital called the house looking for Mom who obviously had not shown up yet. I called her cell to remind her and the response was they were just finishing their last bit of shopping in an area nearby the hospital and would rush off soon for the appointment. It was a short appointment to get her ready for the trip by having all the necessary drugs to bring along and that she be taught how to clean and maintain the Hickman line to keep it free from infection. I left back for KL with a fully loaded van full of luggage late in the night. I was left with one day on Friday to do my own preparation and last minute shopping for the trip. 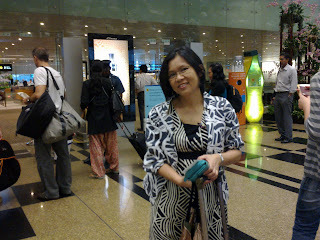 Sat 11th June : Mom had booked the 1pm coach from Singapore to arrive in KL about 5pm with the two boys. At about 2pm plus, I received a phone call from Mom that they were stalled at the second Tuas link crossing to Malaysia due to a massive traffic jam. They only made it across by 6pm and there was another 4 hour journey to KL to reach about 10pm instead of the earlier plan of 5pm! The original plan was for me to pick them up at a stop just outside the KL boundary and have dinner before taking them to the Sentral Station to catch the KLIA express train together to the airport. Though the train ride would take only 28 mins to the airport, this plan now had to be abandoned including the train tickets we had purchased online as we won't have enough time to check in for the flight. We quickly thought of an alternative plan which was to get off the coach earlier near Seremban which was closer to the airport. We would call a radio cab to meet the group at the rest stop off the highway near Seremban to take them directly to the airport while I would be on a separate taxi alone with all the big luggage to meet them at the airport. After all the drama of the day, we gobbled our McDonald dinner as we successfully checked in on time at the airport to fly off a little past 11.30pm! Touch Down pics at Salt Lake City and what follows can be seen by clicking here. Assisted by 3 men to handle all the carry-ons and push her in a wheel chair from the plane to the transit lounge or baggage claim area at every stop over airport, she arrived safely in SLC airport! Gamateh to Mom as she truly is an icon for determination, enthusiasm and courage! Please continue to pray for her too. Thank you. Thank you. Fri 29 July : After being back from the US on 25th June, her 'mobile' chemo supply was topped up again and on this day was her check up with Dr Koo in the early morning to see her latest results after blood samples were taken from her for tests the previous day. It was elating news as her blood platelets were up and cancer markers down. The great joy was added with the attendance of Shuan's scholarship award in the afternoon, making it a triple win week for reasons recorded here. Fri 26 Aug : On this day the follow up visit with Dr Koo after blood samples was taken in the morning revealed positive results again that her blood platelets were up and cancer markers down further. The plan now is to have her continue the chemo but be given a rest period from it for a 2 week period ending on the next check up date. This is certainly very encouraging news. Blood tests will be made on the next check up to see her condition after going with chemo for 3 weeks and without for 2 weeks. Fri 7 Oct : Blood tests done in the morning was reviewed by Dr Koo by noon time to reveal continued improvement in her blood platelets ie. being higher which made Dr Koo very happy as he said this was the important indicator to him. Her cancer markers also continued to be going down further. He now approved to give her a further 4 week break from chemo before the next check up to monitor her progress. This is wonderful news indeed! If the results of the next check up fixed for 4 Nov show continued positive results after a total of 6 weeks without Chemo, it is a sign that her body is taking over to fight the cancer to have full recovery without the Chemo drug. Wed 12 Oct : Our 'Unstoppable Mom' takes to the skies again to attend a training meeting in Hong Kong organized by the Church. Part of her work and calling with the Church has been to maintain this website. On this day in October, she is looking strong at Changi airport and is able to fly unassisted and handling her own carry-on luggage. Thanks to Dr Koo who has been caring and monitoring her progress to this date plus the many friends and family members who have helped in one way or another to give her continued emotional, spiritual and physical support that is blessing her life to recovery! Thank you! Thank you! The Unstoppable Mom is featured in this short video clip with a meaningful song of her favorite artist, Elton John, dedicated to her daughter Su Min that she had given birth to in the month of October many years ago. It is this gal who made it unstoppable for her Mom to be at her wedding in USA as well as all the members of the family who are also featured in this video! It was a dream come true, a fairytale experience indeed! Wed 19 Oct : Another milestone event in our family of joy and happiness that has been great therapy for Mom as seen in this photo is our oldest boy celebrating his attainment of adulthood! Fri 4 Nov : This 4th visit to the clinic of Dr Koo Wen Hsin since our return from the US wedding trip became quite an interesting visit. It would be 6 weeks since Mom's last chemo dosage and we looked forward with great anticipation how the latest blood tests results would show. At the previous appointment of 26 Aug, we had discussed plans to try to wean off the current Chemo drug if possible. We knew Mom was starting to show positive signs of improvement. What was not journalized earlier at that time is the fact that we wanted to know what could be the main reason for the improvement. We had informed Dr Koo about the fact that while in Salt Lake City, Dad was given 2 complimentary cases of a revolutionary product that Mom had started to take a minimum dosage of daily to this date. This was a product that came from a very advanced science of using stabilized Redox Signaling molecules that could be created outside the body. We needed to know whether it was the chemo drug or the test product Mom took that helped her get the consistently improved results so far. Gradually Mom was getting a 'rest' period from the chemo and after the good results of today's test, he would approve another 5 weeks break till the next appointment on 9th Dec. Coincidentally, the front page of the Singapore Health news available freely at the hospital that I had picked up has the headlines, "Smart drugs to battle cancer". According to Dr Toh Han Chong, Head and Senior Consultant, Department of Medical Oncology, National Cancer Centre Singapore (NCCS),"The weapon in this fight is a range of smart drugs - molecular drugs which don't cure but can potentially stop the cancer from growing." The other interesting part of today's visit was the presence of another doctor on a wheel-chair in Dr Koo's room. He was apparently observing Dr Koo in the field of oncology. He was briefly introduced by Dr Koo as Dr William Tan, a world adventurer on wheel chair who has attempted feats like Alpine Skiing and even a wheel chair push across Antarctica! More about this interesting man on this post. Sat 10 Nov : Blood samples were taken the day before and Dr Koo decided to change to see Mom today. Her blood count still showed improved blood count and platelets. Cancer markers seemed good enough for him to allow Mom to be off chemo till the next appointment in January which by then would have had her off Chemo for a straight 3 month period of time! Tue 10 Jan 2012 : Mom didn't start off the New Year well as just before Christmas she could feel that her body was not well with aches in her feet. She started having fevers in the night which persisted and had to be given anti-biotics about a week ago. On today's scheduled appointment for blood tests and review with Dr Koo, the test results were not good. Cancer markers were up and blood count had dropped though still in a safe level. An infection is the possible cause for the fever and Mom had detected some pus from her Hickman line but it is not certain whether this was the main cause of the infection or that her bone cancer cells were getting active again! A decision was made to start her on the same chemo again that had proven effective that allowed her to travel to the US for Su's wedding to get her in a stronger position again. Her next blood test and doctor's appointment is scheduled for Tues Jan 31st. It is noted that Dr William Tan met in the last Nov 4th appointment with Dr Koo was present today as well. Sat 3 Mar : This was the weekend for Stake Conference of the Church in Singapore. I was cooking lunch at home for the family but Geok Lee felt hungry and rushed to prepare something quick for herself. Later in the afternoon she started to feel pains in her stomach which persisted till early evening. The boys left for the evening session of Conference, leaving me behind to care for their mother in case anything happened. By past 7pm the pain had persisted and had become unbearable and the decision was to rush to the hospital for medical attention! A every efficient system got us a ticket number that took us from Screening stage to take her body temperature to an Initial assessment stage by an officer that led to a registration/payment stage to finally a Doctor's consultation stage within a short time. The doctor decided that since she was a cancer patient, it would be best for her to be warded for further observation. Put in a bed at A&E, she was soon wheeled lying down to a ward. I spent the night with her and had to ward off nurses/technicians wanting to take blood samples from her as she complained about it. We felt it was unnecessary as since the chemo restarted in January, she had been having regular blood tests to monitor her progress already. A night doctor agreed but put her on a fast thinking that the medical team that would visit her in the morning might recommend further procedures that required her to be on a fast the previous night! Very soon, the head nurse in the ward also realized that since she was a cancer patient, she should not be in her ward but best be transferred to one in another block specially for cancer patients. As it was already late in the night, this was deferred to be done in the morning. As early as after 6am in the morning, I got a pleasant surprise to see a familiar doctor doing his routine early morning ward rounds. He is Dixon Grant, our friend from Church and the 'new doctor in town' as described in the above posting of 28 May of 2011. He was also surprised to see us and said hello before heading off to the next ward for his duty. 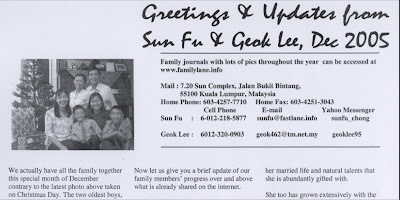 Even before the medical team came on their rounds, Geok Lee already felt better as the abdominal pains now had all disappeared. It was concluded that the pains were probably caused by some form of food poisoning and she needn't be transferred to the other ward but could be discharged. We went home with what I believe to be mixed feelings of relief as well as disappointment. Relief due to knowing it wasn't anything more then just a mild case of food poisoning and disappointment due to all the trouble we went through at the hospital that wasn't necessary. It brought back memories of a similar experience of going to hospital for nothing that occurred about 20 years ago in Nov 1992 as recorded in a journal here. Tue 27 Mar : In this appointment with Dr Koo, the blood test results are showing positive signs that the chemo of the past 3 months has been helping Geok Lee to increase her blood count to normal levels while reducing the cancer markers. As her birthday was next week, she even got a 2 week break from chemotherapy from Dr Koo to resume only on 9th April. She turned 50 on 4th April to begin a 'Never Ending Birthday' celebration as recorded in the family journal post. To follow her journey of going back to the hospital, it is best to click here. Thank you for the posting. Felt teary reading it. GL is an amazing lady. She is an inspiration to me. Will pray for her well-being. Heavenly Father knows her heart's desire. Heavenly Father is loving. I know he will make it possible for all of you to be together at your Su's wedding. God bless all of you. He specializes in cancer and does continuous research and seminars on this subject. May God's wisdom and blessings be upon your family. Yes it is amazing as they say that many hands make light work and in Geok Lee's case,it is a power of God working through so many hands, hearts and minds from so many places to help her heal through the crisis. I can only be eternally indebted to so many for the energy and love that is felt in our family especially Geok Lee who is further encouraged and strengthened by it! Thank you. Thank you.